Maybe you run a small startup where office space is at a premium, or maybe you’re trying to add a home office to an already-cramped apartment. You may be wondering how you’re ever going to set up a productive workstation when you’ve only got a closet-sized space to work with, but fear not—it’s entirely possible to set up a comfortable office in a small space, as long as you make some smart choices with your office furniture and storage units. Here are a few tactics that we recommend to make the most of limited square footage. Don’t have a lot of floor space? Take advantage of your vertical space and add some floating shelves. This will give you a lot more storage space while still leaving space for a desk, chair, and any other furniture that is essential to include in your personal work environment. If space allows, add a bookcase that is taller than it is wide so that you’ll have more storage space along the wall. Store items that you use less frequently on the top shelves and keep the things you use more regularly within easy reach on the middle and lower shelves. When furnishing a small office, it’s always a good idea to choose storage units that can be moved easily. For example, you can use an under-desk file caddy to keep important documents close at hand; just wheel the caddy out when you need it, and push it back under the desk when you don’t. If you don’t have enough floor space for a conventional desk, you can add a drop-down wall desk. This compact type of desk folds out from the wall to give you a temporary workspace and folds up against the wall when you’re not using it. A wall desk is a good option when you only need a small writing surface or if you just need a space big enough to set a laptop. 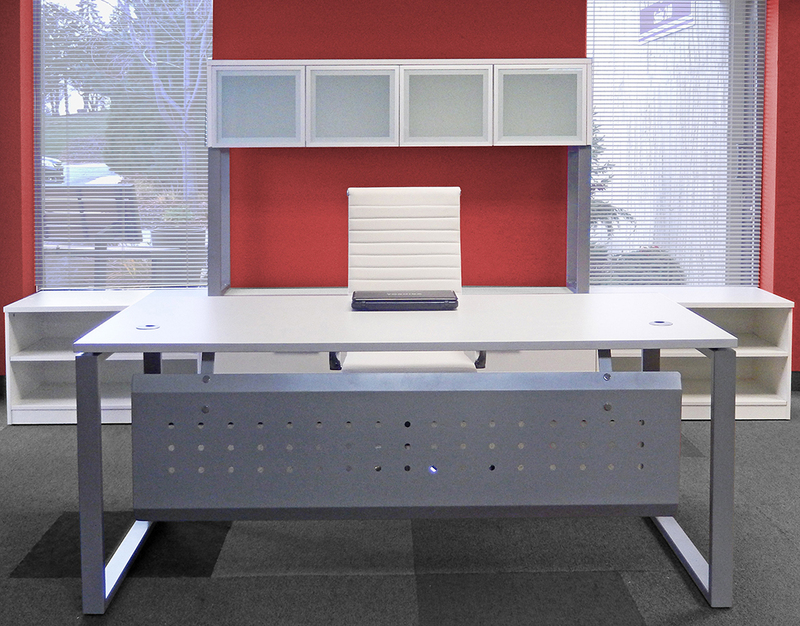 Adding white furniture will ‘lighten up’ a small space office and make it feel bigger. 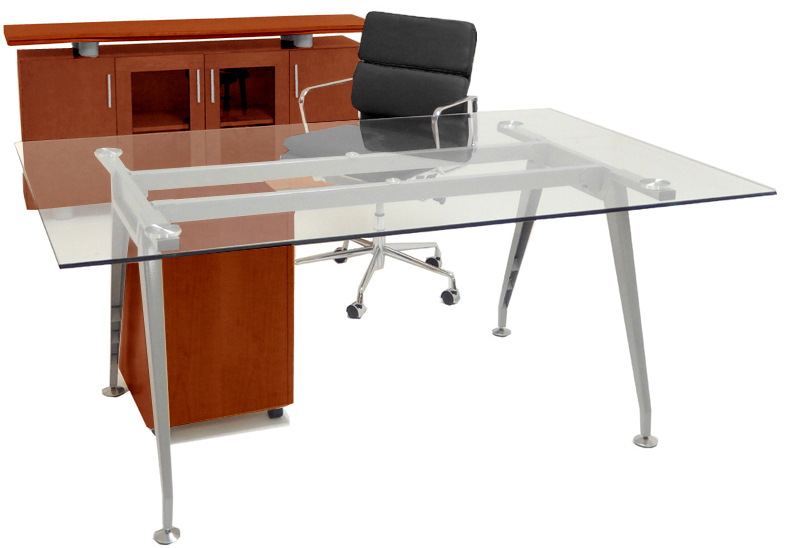 Or select open leg design desks or glass top desks so that the furniture does not occupy visual space. Making sure you have good lighting, whether it comes from a window or lamps, will also help make your space feel less cave-like (and reduce the strain on your eyes). Look for office furniture with closed storage (such as a desk with drawers or cabinets) so that you can keep the files and supplies you don’t use regularly there, reducing the appearance of clutter and making your office feel less cramped. 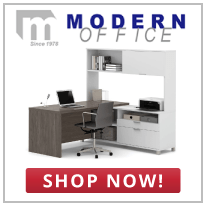 Need more help finding furniture to fit a small office space? Feel free to contact us; one of our experienced Modern Office representatives can recommend the right desk, chair, and storage units for your work environment.